Hull and engine both built by Frank Bills and registered with the Wulfrana club, which took a few minutes to track down. It is an old term for Wolverhampton apparently. Frank was very active in the West Midlands and had close links with Bob Thomas, hence the similarity in design with Enid. Frank ran at Kingswinford and Bournville and was a timekeeper for the only recorded running of the mysterious 1066 hydroplane. We hope to establish more about Frank and his two sons who currently own the boat. 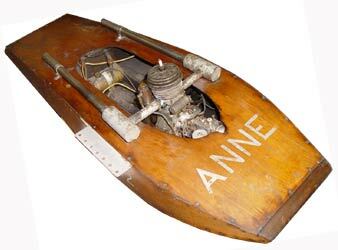 The motor in Anne is another example of a Westbury Atom V. The boat was seen at the Midlands Exhibition is 2012. The translation from the Latin means little wing, and this Mike Drinkwater design from 1957 shows how the airscrew class was developing from the original twin float 'hydro glider' design. The concept is that the hull actually flies with just the sponsons touching the water, and the faster it goes, the less they touch. Rules dictate that the hull must touch the water at least twice per lap, so the balance of wing area, incidence and speed are critical. The twin float design died out in the 1970s in favour of the standard B1 style boat still in use today. 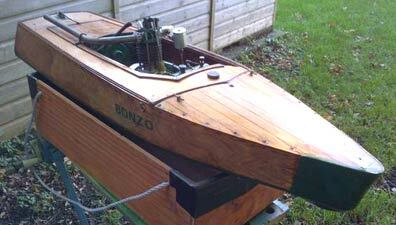 When this boat appeared on ebay it caused something of a stir as it was recognised as an original Lindoh, built by its designer, Mike Drinkwater. The design was from the 1960s and at some stage the boat had been passed to a member of the Hull Club where it resided until being offered for sale. Luckily, Peter Hill knew the then owner and was able to broker a deal to stop this piece of British airscrew history from heading overseas. 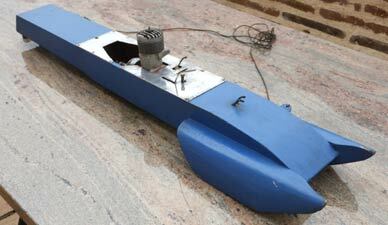 A true 'vintage design' that it is hoped to see back on the water at some stage. This little boat found on ebay is unusual in all respects, being powered by an early Mk III Oliver Tiger 2.5cc diesel. 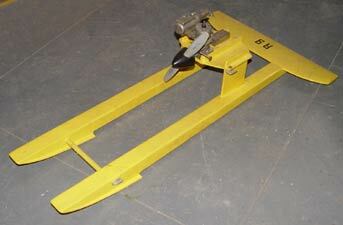 The hull has a great deal of lift, hence the extreme down thrust on the skeg. There is more known about the boat and engine though. 50 years ago, the Flash design by Ivo Malfatti was very much standard ware in the 10cc class. He used it to great effect in World and European Championships as did fellow Italian, Swiss and German competitors. 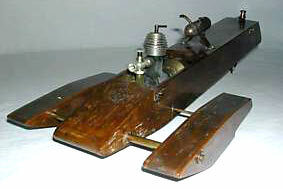 The design reappeared in the UK in vintage competitions where the rearward position of the motor and wide hull with integral sponsons ensued that any fast runs were accompanied by the boat taking off and somersaulting. 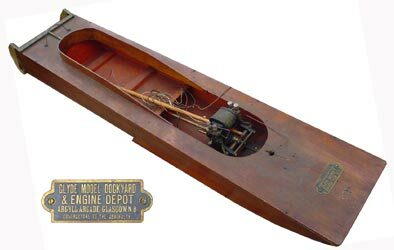 This was another of Dr Chabelard's boats, which with its McCoy 60 motor made £500 on eBay. Ballerina but not a tutu in sight. This was one of the boats originally owned by Dr Chabelard that came up for sale recently. The Ballerina design by Mike Drinkwater dates from 1954 and his original version had an ED Racer fitted as does this one. Dr Chabelard was the President of the Algerian Federation of Modellers whose member used to contribute regularly to the French magazines. 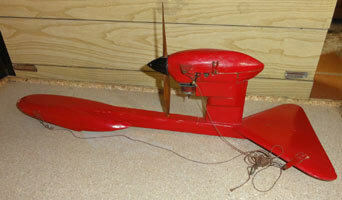 The boat realised £291 on eBay, something of a record for a vintage airscrew. This oddly shaped hull came with a steam coil in a Milk tin and a lovely set of pumps but nothing else. The only clue was that it was built be a 'very well known' flash steam exponent. The fact that it was never finished might well be due to its very odd design and a realisation that it wasn't going to work. Any help appreciated. 'Bonzo', registered as BV 141, has been around for a while with the owner appealing for further information. 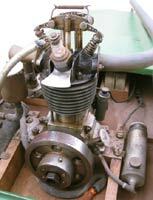 The motor is another example of the 25cc or 30cc Grayson or one of its many imitators and contemporaries. The best guess on date is probably the early 1930s and the shape and deck lining may well mean that it was primarily intended for straight running. If anyone can shed any further light on this lovely craft, then the owner would be most grateful. As far as we can trace, this was the last of a series of boats built by Mr C.P Robertson, a member of the Bristol Club. 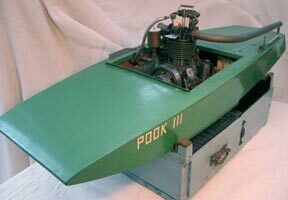 Its predecessor, Pook II was awarded the certificate seen above in the 1937 Speedboat Competition having achieved a speed of 35.57mph in Class A. Pook III would seem to date to just after the Second War, still using the Bonds/Gamages/Grayson based 30cc motor. Whilst the bottom half of the motor is basic Sharpe design, the cylinder head is much more sophisticated, which would have improved performance radically. Illustrated is the clockwork mechanism used to advance the ignition and open the strangler after the boat was launched. The boat is complete with box, spares and design sketches, a lovely example from the period, which we hope to cover in more detail after some research and digging. Update Jan 2013: Thanks to John Benson, Phil Abbott and Alan Rayman who have confirmed that the boat is almost certainly Blitz I and the BH 6 registration down to the boat having been given to Jack Brookes of the Blackheath Club before the 1948 season. It is only when you look at the Mills motor nestling in this little hydro that you realise just how small it is. There was no other information about it when it appeared on ebay, other than that it might be connected in some way with George Lines. We would be delighted if the current owner could contact us with any further information that might have come to light. 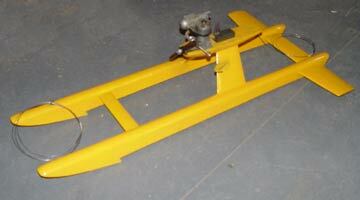 This, very early, tinplate hydroplane hull was built by Ted Vanner nigh on 100 years ago. 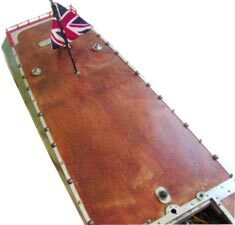 The bare hull was discovered in a loft and has been re-united with a contemporary Vanner built horizontal motor. The fascinating story of the find and subsequent renovation is the subject of a future 'Pitbox Special'. Square engines are almost exclusive to the North of the country and this example is in a typical early outrigger style hull from the 1960s. 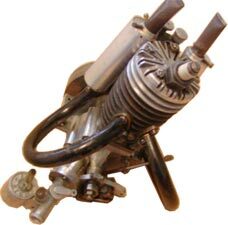 With the motor being homebuilt, it would be eligible for the 'C' class that ran parallel with the restricted class for commercial motors. 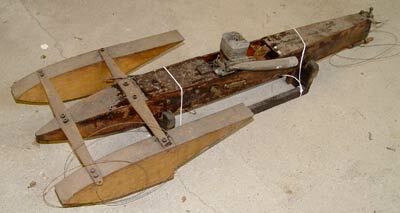 It is a true 'garage find' being just as it came off the water several decades ago. The boat has now been fully restored by Jim Jamieson. The boat and engine looks like one I saw in a antiques shop in Blyth Northumberland in the 1970's. 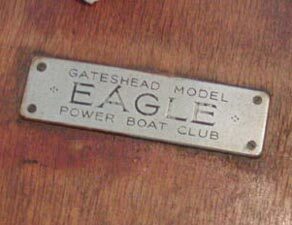 From memory the boat was named Eagle & had the port of registration Gateshead Model Boat Club on the stern. It was a straight running model. At the time it was thought that the builder was a Norman Dixon who had joined the Heaton & District Model Power Boat Club in 1938. The style of construction was remarkably similar to his work. He died in 1965. None of the older members who were around in the 1920 - 30's knew of the existence of the Gateshead Model Boat Club which would have sailed on the Saltwell Park Lake, very near to where Norman lived. 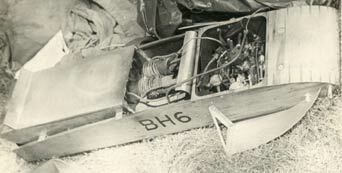 The engine in the boat was identical to the one in your photo's. Norman was a skilled engineer & in the early 1930's went into teaching what is now called craft skills at Gateshead Grammar School. It is definitely the boat I saw in the 1970's. 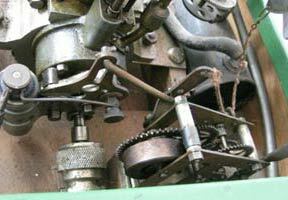 I have been having some extra thoughts on the engine, It could be a Gamages engine machined from a set of castings. you will not find a similar one as, if it is one that Norman built, he would have made his own changes. The boat is the one I saw as Norman was the only one who fitted metal edging strips to the deck of his boats. These would not be holding the deck down, it would be held by screws underneath. 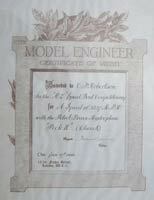 Norman was a craftsman in every thing he did, his skills were a great loss when he died. There is no doubt about the name of this boat, which carries a North Staffs registration as well. Under the grey paint is still the original black finish with name down the entire side, so there is no doubt as to its origins. The only reference to a boat with this name however is a Mr S. Cooper of Fleetwood back in 1935, where the capacity of the motor is given at 20cc.